Austin Wholesale Decking Supply has been supplying Texas and the US for over 19 years with the finest building materials for decks, decking, wholesale lumber, composites, hardwood decking and fencing materials available, such as: Western Red Cedar, Redwood, treated Pine, Ipe (aka ironwood), Douglas Fir, Massaranduba, Tigerwood, China Cedar, Angelim Pedra, Garapa and Cumaru. We also supply composite decking and plastic decking and lumber from companies such as: Lattitudes, AmeraDeck and many others. Our wholesale lumber and building materials sales staff are very knowledgeable and helpful and are trained to assist you with the selection of wood, decks and decking, and fencing materials best suited to your project. 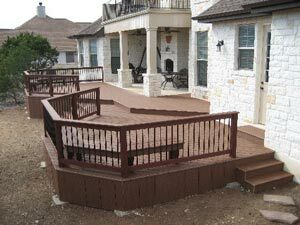 Austin Wholesale Decking Supply is located in Austin, Texas, serving the construction, fencing and decking companies that are a large part of our customer base. [Locations in Austin, San Antonio and Dallas.] Our decks, decking, wholesale lumber and other building materials are competitively priced and we ship nationwide. Please contact us today for all your outdoor building material requirements. We are here to help! Clearview Services, Inc. specializes in window cleaning, power washing and gutter cleaning. San Antonio Window Cleaning – Clean windows can make a huge difference in the atmosphere of your home, and it can be an essential element in your business’ image. Whether at home or in your place of work, you can rest assured that your windows will be cleaned by a licensed, insured professional window cleaner. When you hire a window cleaner, you probably want more than just clean windows. You want timely, reliable service from someone who cares about your satisfaction. We at Clearview are certain that we can offer the most professional and consistent service in the industry to our clients and pledge to our customers the finest value window cleaning services. Additional Cleaning Services Include: Storm windows, Screens, Light Fixtures, Ceiling Fans, Mirrors, Skylights and Gutters. Commercial & Residential Power Washing Services – Clearview Services offers low and high pressure cleaning for all types of surfaces. Our services include building and house washing, concrete, brick, stone and stucco cleaning, deck and fence cleaning. 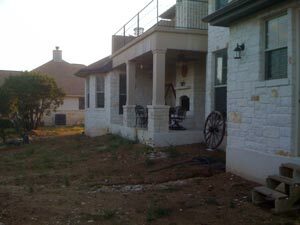 Power washing removes, deep ground in dirt, gum, bird droppings, mold, algae, and most stains. Additional Cleaning Services Include: Dumpster Pads, Drive Thru Areas, Walk & Driveways, Graffiti Removal and Awnings. Roadrunner Decks utilizes state of the art software design called Simpson Strong-Tie® DeckTools™. This gives us the capability to produce a series of 3D images created from your own personal design ideas. 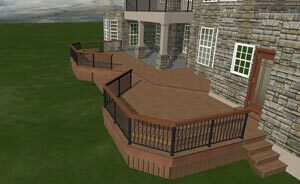 Roadrunner Deck's state of the art highly developed 3-D software lets you see a simulated version of your deck before the groundwork gets started!